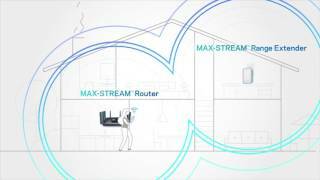 Linksys EA9300 Max-Stream AC4000 Tri-Band WiFi Router is rated 4.1 out of 5 by 79. Experience powerful WiFi coverage throughout a very large house. Maximize the WiFi performance and coverage for both 2.4 and 5GHz. Unleash the potential of your home WiFi and enjoy exceptional wireless speeds with the Linksys MAX-STREAM AC4000 MU-MIMO WiFi Tri-Band Router (EA9300). Featuring Tri-Band technology, the MAX-STREAM AC4000 is ideal for households with heavy entertainment streaming and online gaming needs. Three dedicated WiFi bands deliver combined speeds of up to 4.0 Gbps, offering enough speed for 4K video streaming, simultaneous online gaming, video conferencing, and other demanding tasks. Devices such as 4K TVs, HD streaming media players, tablets, and game consoles consume a lot of bandwidth. With MU-MIMO (Multi-User Multiple-Input Multiple-Output) technology, the EA9300 router sends WiFi to multiple devices at the same time and same speed. It's like having a dedicated WiFi router for each of your devices. Households with heavy WiFi use will experience fast data transfers thanks to this gigabit WiFi router's combined 4.0 Gbps speed and Quad-Core CPU. Each CPU core can handle a different task, greatly improving efficiency and overall performance. Improve your overall home WiFi efficiency with the EA9300 thanks to Airtime Fairness, a feature that ensures even, fair distribution of WiFi to different devices. This helps reduce the lag associated with slower WiFi devices. Smart Connect feature balances your 5 GHz WiFi connections and intelligently chooses the best radio band for your devices for the best WiFi performance of your network. Traditional routers and range extenders force you to manually connect to either the range extender or router's network in order to experience the best WiFi signal as you move about your home. When paired with a MAX STREAM Range Extender, the EA9300's Seamless Roaming support allows your devices to automatically connect to the strongest WiFi signal by utilizing a single network name. Then enjoy a strong, seamless WiFi signal in every room of your house. Equipped with Advanced Beamforming technology, the EA9300 maximizes wireless performance by focusing its WiFi signal directly to your device. 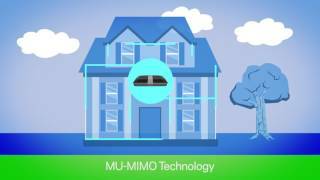 This helps boost coverage and eliminate wireless dead zones in your house. This latest iteration of Beamforming supports both 2.4 and 5 GHz bands. When paired with Amazon Echo, the EA9300 gives you access to a variety of convenient voice commands. Toggle your guest network on and off, customize your WiFi settings, and more using just your voice. Guest Access: Create a separate password-protected WiFi network for up to 50 guests and easily share the password. Is Your Router Lagging? Maybe It's Time to Upgrade. Rated 5 out of 5 by zerokeul from Easy and Fast The EA9300 does exactly what it is supposed to do. It sends invisible internet to all your devices. I moved to this form a WR3200ACM, both of witch have MU-MIMO and beam forming tech. The difference is the EA9300 theoretically has faster data transfer speeds. Also the EA9300 does not have open VPN right not, however it is promised with a firm ware upgrade. I stream all of my TV content as well as have two phones and three tablets and two laptops. Usually all on at the same time, and have seen no issues with reliability. If you are looking for a new router and you are a heavy user (multiple devices at the same time, streaming a lot of content) then this is the router for you. Rated 5 out of 5 by ribouch from The fastes Router Yet Well received this a while ago but was so busy just got to it and boy I an glad I did. This EA9300 router is the fastest router I have used by far. I had done some speed test a couple of weeks ago and an example : Download 33.777 and Upload 12.18 now download is 46.61 and upload is 18.76 so a pretty good increase. Easy setup provided you read all I did a quick read and setup picked up my old router setting (because I left it on ) so I reset and voila all set. Great router Oh I should say I have pretty good internet speed to start and using a wired connection I had 120 up and21 down! I can tell you never attain those speeds prior !. Rated 5 out of 5 by MostUser from Stable and fast. No need fancy features Unlike other brands, Linksys focuses on stability. My last Linksys router used for 7 years and only disconnected few times. But this EA9300, it is a "bunker". My office has 10 people working on 3D designers and gaming - most heavy users. Few Macs + PCs + mobiles + servers+ totally more than 20 devices with YouTubes, facebooks whatsapp all connected to this EA9300 with 2 switches and wifi. Used it for a month, in 5 x 10 hours it keeps stability, stay connected and go much more faster than my old Linksys model. I have tried another brand Nxtgxxr which was provided by network company. It was down every day. Clearly only Linksys can get the job done. Keep your good work! Rated 5 out of 5 by Phattrider from Awesome router I've had this router for almost a month and absolutely love it. Speeds have increased for 0ur 3 hard-wired PC's, our 9 WiFi devices have great connections and with it's wireless range I did away with the 2 extra routers I had as extenders. It was super simple to setup and get everything online. One feature I wish it had, and hope they send out as an update to add, is VPN. The $300 price tag was a bit of a shocker but after a short search I was able to find it on sale for almost 50% off. Even if I paid the $300 it would still be worth it. This router is a must have. Rated 5 out of 5 by Tony from Great Router!!! My name is Antonio I am writing a review on the Linksys EA9300 router. I have to start by saying was incredibly easy and fast. I used the smart Wi-Fi app so setup took about five minutes. I have had the router for about a week I wanted to fully test it before doing a review. I have done a lot of playing with and messing with the setting. I must say it’s one of the best router I have ever owned. It really fast I have been having internet before getting it and I am getting better speeds and more consistently. I will highly recommend this router to anyone that wants a good router. You can fix a major headache by getting one I know it really fixed mine. I love it!!!! Rated 5 out of 5 by Alain from Great Router Set up was almost as easy as plug and play. No problems there. After connecting all devices, I noticed a significant improvement in download speed - so did my wife - and that's saying something! After a few weeks of testing the router and looking for negatives, I can say for certain, I haven't encountered any. The only problem I foresee for some individuals, it might be an eyesore. Personally, I think it looks cool and it reminds me that we're living in the best (technological) times ever! The Linksys AC4000 Router won't disappoint. Full Disclosure: I received the product for free to sample and give an honest review. I have given you my honest review and opinion. Rated 5 out of 5 by mfmayes49 from work great This is a nice tri band router, not as fast as the EA9500, this router has tri stream compared to EA9500 quad stream. But the EA9300 in specs beats out the EA9500 version 1. The Ea9300 has a quad core 1.8 processor with 256 MB of flash ram and 512 MB of system ram. the version of the EA9500. Version 2 is suppose to be higher in specs with 1.8 quad core processor and 128 MB of flash memory and 1 GB of system memory. All in all, you can't go wrong with this model. I have 30 devices connected to it and it has not slowed down a bit. The NAS of this device is very fast. Rated 1 out of 5 by Phil from If you want headaches... ...get this I bought this a month ago and was a replacement for an out of warranty EA7500 that decided to die on the month it goes out of warranty. It worked for a few weeks. To be honest, I did not notice any "upgrade" compared to my previous router. A week ago, it suddenly lost both the 5ghz band. It took a hard reset to get it to work again. Then 2 days after, the 2.4ghz decided to to be incognito, another hard reset. then my wired Roku started lagging and my wired PC started an up and down swing on it's connection. I just got an approval to return this to where I got it and would cross out Linksys as a brand to choose from.